The hydraulic broaching press from RHTC is exclusively made in the Netherlands and can be used for linear broaching. 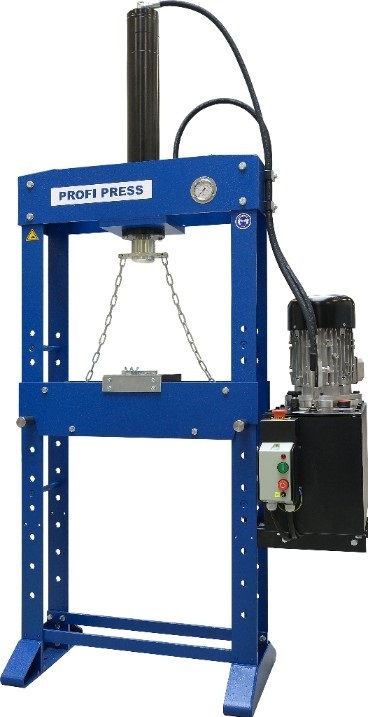 The Profi Press hydraulic broaching press is made of quality steel, has a capacity of 15 ton and a piston stroke of 600mm.This type of Profi Press is equipped with a hand operated up/down valve (no hand pump), a speed control valve and a 220V CEE plug connection. This broaching press is totally suitable for precision machining tasks. The hydraulic broaching press from RHTC can be delivered straight from our stock and includes an user manual. All RHTC products are delivered in accordance with the latest CE standards and therefore we deliver this Profi Press with a warranty of 2 year.